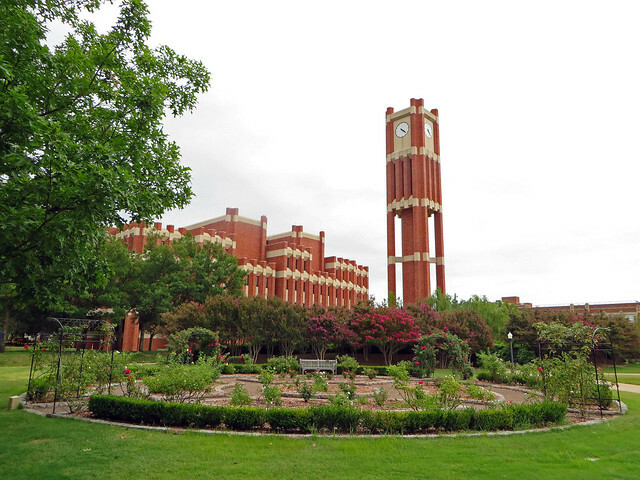 Recently I was in Norman on the campus of the University of Oklahoma, where I earned my bachelor’s degree over 25 years ago. I’ve been drawn to Norman on school-related business a few times over the years, but usually I only have found time to drive quickly by the various new and renovated buildings and campus improvements. My tourism has focused on the Sam Noble Museum of Natural History, which replaced the old Stovall museum in 1999. But this time I had several free hours and my interest in art lured me back to the Fred Jones Jr. Museum of Art. 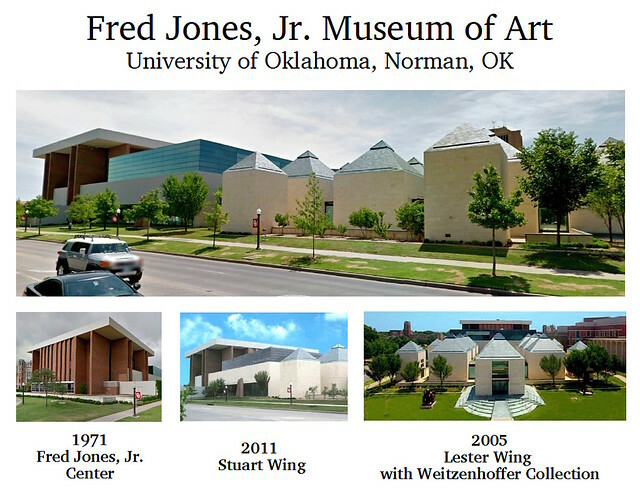 When I was an undergraduate, it was called the Fred Jones Jr. Memorial Art Center and restricted to an early 1970s building with outdated and somewhat dark and uninspiring galleries. Back in 2000 the university received the gift of the Weitzenhoffer Collection of French Impressionism, consisting of 33 works of art by Degas, Gauguin, Monet, Pissarro, Renoir, Toulouse-Lautrec, Van Gogh, Vuillard and others. It is the most important collection of French Impressionism ever given to an American public university, and in 2005 the new Lester Wing opened and became the home of that collection while providing much more space for other works of art. I toured the wing before 2010 and liked the architecture but was underwhelmed by the Weitzenhoffer Collection, as I am not overly fond of Impressionism. 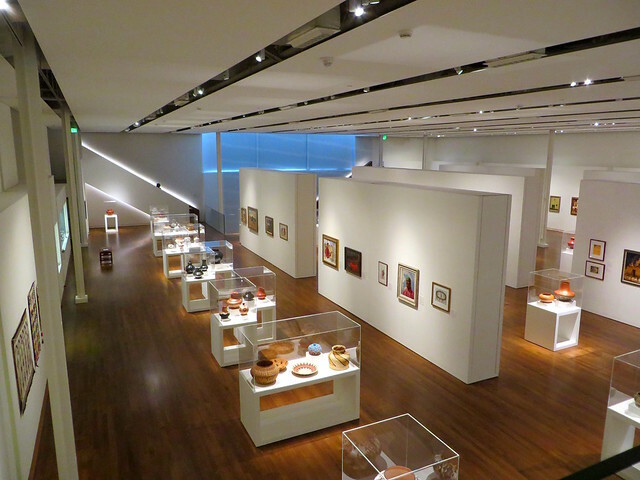 So I had moderate expectations for this visit, but was happily surprised to find that the older section of the building had been expanded with several more gallery levels in the Stuart Wing, filled with a large collection of southwestern art and several temporary exhibits. 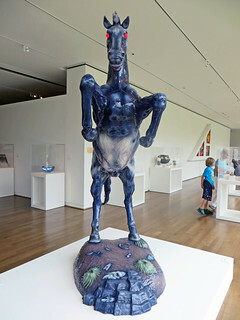 I noticed Adrian Arleo‘s ceramic Lead (Woman with Two Horseheads) with its odd striations, but Luis Jiménez‘s Mustang (Mesteño) with its glowing red eyes and blue-and-white body was a standout. Those eyes really add something to the fiberglass work. In the same gallery one will find the related lithograph. Both of these works relate to a larger one outside the Denver airport. Perhaps the Mustang is as evil as its red eyes make it appear: the artist was killed by a piece of the torso which fell as he sculpted the larger statue at his studio in New Mexico. His two sons, working with others, finished it. Far less intimidating were a number of black-on-black pots by Maria Martinez, the San Ildefonso pueblo artist Wendy and I learned about during our stay in Albuquerque on the first of July. A wedding vase from 1929 and a huge lidded jar from 1967 showed the variations in her work with other artists over the decades. 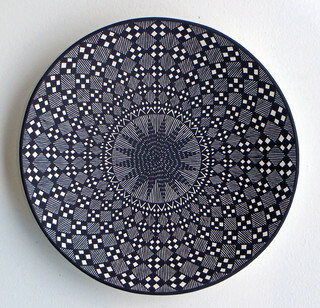 Two small ceramic works by Rebecca Lucario of the Acoma pueblo were particularly striking in their studied intricacy. A miniature platter was covered in “eyedazzler” patterns which she painted with yucca grass and black slips, and a nearby vase showed similar creativity and attention to detail. José de la Cruz “J.D.” and Sofia Medina, of the Zia pueblo, produced a nice Polychrome Jar with Dancers in the 1970s which depicted several different dancers on its white painted surface. I turned the corner from those happy scenes to be confronted by a Skeleton Figure Mask from Mexico. Another sort of ambush was depicted in Henry Farny‘s Suspense, of gouache on paper from 1890. In it, an Apache waits in hiding to attack his adversary. I loved the expression on the Apache’s face. The much larger Yeis in Chanting Procession by Tony Abeyta depicted three dancers in the cermonial guise of the Yéi or Holy People of the Navajo, likely involved in the Nightway ceremony of healing. A large and quite striking oil painting was Hopi Snake Dance by Cornelia Cassady-Davis in 1897. The dancers are caught mid-step with snakes held in their mouths and hands, having just rounded a sacred rock. 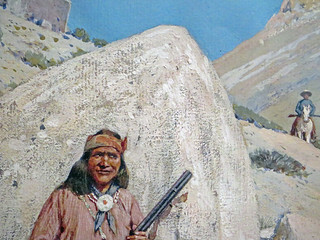 This painting once graced the El Tovar hotel on the rim of the Grand Canyon. You feel like the dancers are coming right at you as you stand in front of this fine work, being transported to the depicted surroundings. These works and much more grace the airy yet warm Stuart Wing. The more intimate Lester Wing has recreations of several rooms of the Weitzenhoffer home in Oklahoma City. So Impressionist paintings are joined by 18th century English furniture, Chinese export porcelain, and other antiques which Clara Weitzenhoffer left to the university. The dalmations I could well live without, but in the dining room I liked the bold lines and colors of Raoul Dufy‘s Paddock. During a tour with Wendy of the museum, she pointed out Shoson Ohara’s Nandina and Flycatchers in Snow from 1929, saying it reminded her of photos I’ve taken of my own nandinas in wintertime. Having completed a tour of the interior, it was time for exterior sculptures. 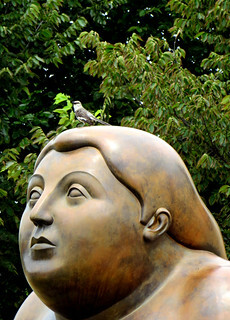 Out front, a bird was happily chirping atop Fernando Botero‘s typically bulbous Sphinx bronze, which squats outside the entrance to the Lester wing, its curves contrasting with the linearity of the building. I’m not fond of that sculpture, a gift of Jerry Westheimer. Wendy and I both prefer the granite Interlocking Triptych by Jesús Bautista Moroles, which Westheimer also donated, grateful that it is the backside of that one sees from inside the Stuart Wing, and not the backside of the Sphinx. Across the street is Boyd House, where OU’s President Boren resides. On the opposite side of the museum one finds Glenna Goodacre‘s white marble Bather, which is quite lovely, but quite still in contrast to the swirling liveliness of Kim Walker Ray‘s The Dance, a bronze ballerina tucked away on a small plaza for the Don Reynolds Performing Arts Center located south of the museum. A statue by Paul Moore of the university’s longest-serving president, George Lynn Cross, sits out in front of Evans Hall, the beautiful administration building of 1912 which anchors the north oval. Its Cherokee Gothic architecture is echoed in many of the university’s academic buildings, influencing the much more severe 1982 Neustadt Wing which is now the main entrance to the Bizzell Memorial Library. The E.T. Dunlap clock tower out front was a final construction project under the leadership of the somewhat controversial university president Bill Banowsky back when I was attending OU in the 1980s; we wags unkindly termed it “Banowsky’s Last Erection”. I ventured inside the library, where the large room filled with card catalogs back in my day now brims with computer terminals. But I was glad to find not everything had changed. 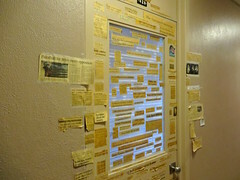 Decades ago I prowled every corridor and stack of the library and was amused by how the door of professor David Levy’s office in a back hallway was plastered with funny newspaper headlines; the professor has retired, but the clippings are still there. The latest wing at the art museum is just another example of how OU’s facilities continue to expand and improve, living up to its motto of Civi et Reipublicae: For the benefit of the Citizen and the State.